It is difficult to imagine the women whose hands made the clothes we are wearing at this moment in time. It is impossible to comprehend and visually understand large numbers of loss of life. My hope is to move you to consider the lives and working conditions of the people who sew our clothes, on the other side of the planet, as you read this. 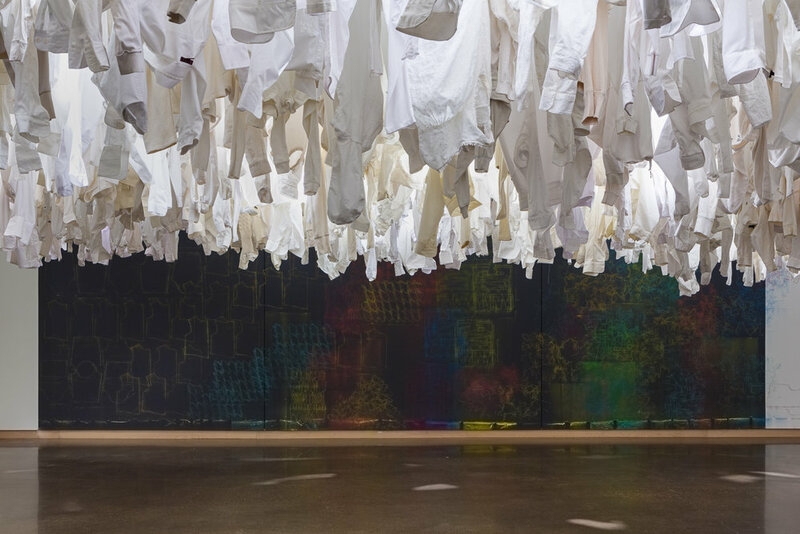 1281 white shirts commemorate the 1,281 garment workers whose lives were lost in the combined tragedies of Triangle Shirtwaist and Rana Plaza. I combine these two tragedies to emphasize that they are not separate stories but one story that describes the way capitalism, globalization and consumerism influence labor conditions for working people throughout history and across the globe. The shirts refer to the white shrouds used to wrap corpses in Bangladesh and in the Jewish faith. 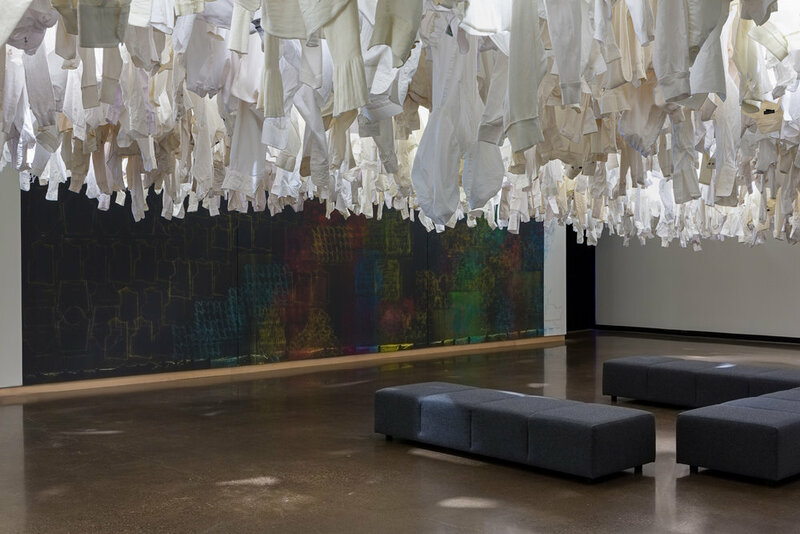 The shirts also reference the white cotton shirtwaists sewn and worn by New York women garment workers at the turn of the century, and the clothes sewn by Bangladesh’s garment workers. Sleeves hang down towards the public, reaching for connection that is absent -- our lack of recognition of a connection to these workers whose arms have sewn our clothes. But there is another story here as well. All 1281 shirts in this installation were purchased at the Goodwill Outlet, the last stop in the supply chain before these garments are either sent to a landfill or sold by container to buyers in the global south, displacing local garment industries across the ocean in order to make “room” for more clothes in the US. Averaging different shirt prices results in roughly $34.00 for a shirt. Bought new, these 1300 shirts @ $34.00 = $44,200.00. The Institute for Global Labor and Human Rights estimates that women are paid about $0.22 to make a shirt. Using this amount, women were paid about $286.00 1300 shirts. At the end of the supply chain, bought by the pound, 672 pounds of garments cost $667.28, which comes out to $0.51 a shirt. Media: Shirts, dresses, jackets, sweaters, sheets, thread. Exhibition "The Price of Our Clothes, a material meditation on garment factory disasters" at Carlton College in Northfield, MN, March 26th – April 27th, 2018.